To order an access fitting body only, use the first four characters on the chart. Example: If a 1/4" Tee 4/600# ANSI Flange RJ fitting made of Duplex SS is required, order part # HP5135. To order a body with a plug assembly, use the first seven characters on the chart. Example: If a 3/4" Tee 4" Flareweld made of ASTM A105 Carbon Steel is required with a solid CS hydrin o-ring Teflon® packing plug, order part # HP1332155. 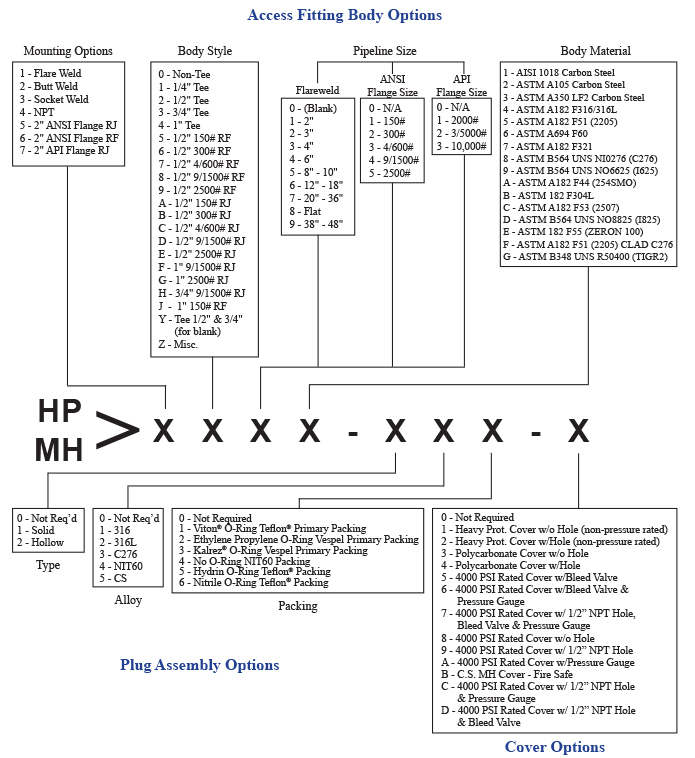 To order a body with a plug assembly and a cover, use all eight characters on the chart. Example: If a Non-Tee 9/1500# ANSI Flange RF fitting made of AISI 316 SS with a hollow no o-ring NIT60 packing 316 plug and polycarbonate cover with no hole is required, order part # HP60442143.